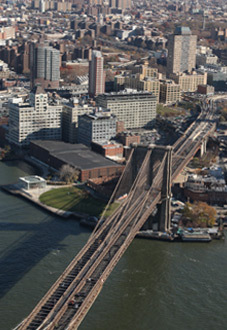 Dumbo Heights is a five-building campus along the East River waterfront in Dumbo, Brooklyn that comprises more than 1.2 million square feet of exceptional office, retail and high-tech space. The complex is in the heart of a thriving population of tech start-ups, galleries and performance spaces. With efficient floor plates, high ceilings, options for private roof decks and ample natural light, the buildings on the Dumbo Heights campus are primed for any tenant. Dumbo Heights is just steps from the F, the A/C and the 2/3 trains. Surrounded by 10 colleges and universities, 80 arts and cultural institutions and thousands of new, completed residential units, Dumbo Heights is central to the thriving surrounding community.